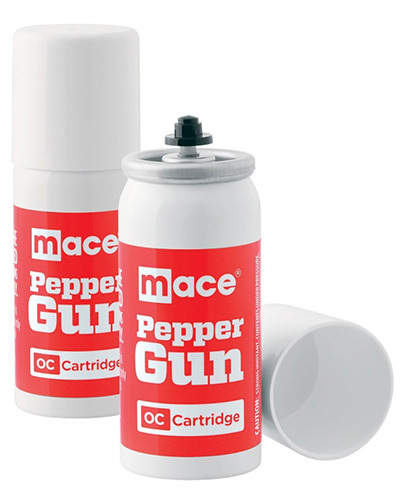 The Mace Pepper Gun OC Spray Refill Cartridges Pack features 2 pepper cartridges (.74 Capsaicinoids) featuring an advanced delivery system bag-in-a-can technology for the MacePepper Gun. Each OC pepper cartridge contains 28 grams. Pepper Mace has a powerful Oleoresin Capsicum (OC) pepper formula that creates an intense burning sensation and causes an attacker’s eyes to slam shut upon direct contact. OC pepper is a naturally occurring substance derived from cayenne peppers.